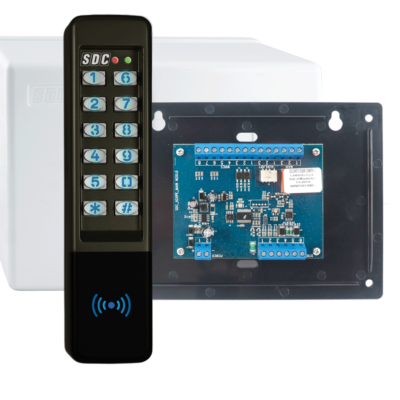 The SDC 921P and the 924P EntryCheck™ are indoor/outdoor stand-alone digital keypads with Prox Reader & Controller (2-piece configuration), designed to control access of a single entry point with up to 500 users. Available Factory Direct only. While supplies last. Excellent opportunity for an experienced System Design professional with experience in electrified hardware and access control system design and installation to join our team. 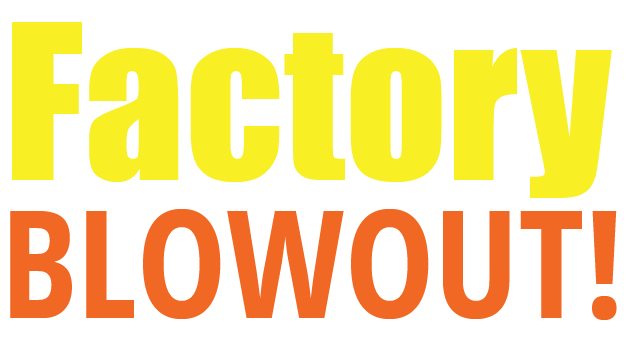 The successful candidate will have proven Door Access & Egress Control System Design and Troubleshooting success and impart knowledgeable industry experience in answer to product questions. Strong Product application and installation assistance skill is a must. Reporting to the Vice President of Sales, the System Design Associate will partner with other technical and customer service facilitators, system design staff and department heads to promote a strong customer advocacy culture and work cohesively with other functions and teams. Excellent opportunity for an experienced Technical Product Support professional with expertise in a high-volume call center environment to join our team. The successful candidate will have demonstrated the ability to master the technical aspects of products and services, while delivering best in class levels of customer satisfaction. The qualified candidate will have proven Technical Troubleshooting success and impart knowledgeable industry experience in answer to product questions. Strong Product application and installation assistance skill is a must. Reporting to the Vice President of Sales, the Technical Product Support professional will partner with other technical and customer service facilitators and department heads to promote a strong customer advocacy culture and work cohesively with other functions and teams. In response to increased demand from the Glass Industry for access & egress door control solutions, SDC has tapped its Central Regional Sales Manager, Mary Hester, a 17-year glass industry veteran, to lead a new initiative for easing the adoption and practical application of electrified hardware to glass doors. 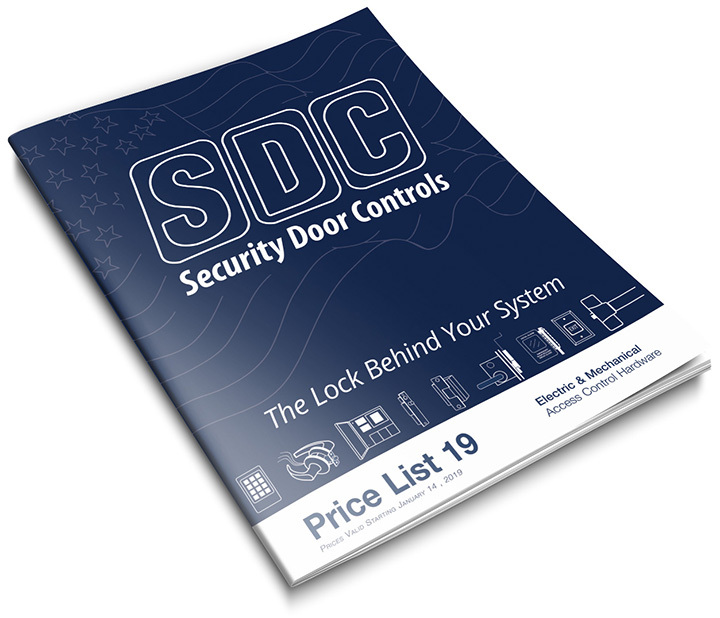 To that end, Mary is overseeing the assembling of SDC’s many code compliant, electrified hardware products – door operators, exit devices, access controls and locking devices – into complete electronic system solutions for glass doors. 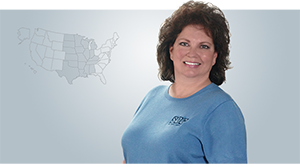 Besides originating comprehensive training modules, Mary has worked extensively with SDC’s product and marketing personnel to ensure glass professionals will have the information, benefits and installation details they need to be proficient, efficient and cost-effective in selling electrified hardware and solutions. “Look for our specific Glass Door Solutions initiative sometime in the 2nd quarter of 2019, on the website and in our marketing. This market has been clamoring for more electrified hardware applications and SDC happens to be a great fit. I’m very excited about what we’re bringing to market.” Mary concluded. The Science and Technology students of the future need our sponsorship! With categories from Animal Sciences to Physics, the science fair is designed to promote, encourage, showcase and reward the achievements of our students in the various fields of science. By developing skills in science, technology, engineering and mathematics, students are laying the groundwork for their future success. Spreading the excitement of science is a cooperative education effort. Without the help and support of our sponsors, volunteers, parents, and teachers, this worthwhile event would not be such a great success. On behalf of my office and the Science Fair, I thank you for your participation and hard work, and look forward to a fun, successful, and educational event. The Science Fair brings together students, teachers, and scientists from around the county to: Develop in students an awareness of the importance of science in their lives and to cultivate students’ interest in science; Support students’ acquisition of scientific knowledge and research skills; Extend and reinforce the Science Content Standards for California Public Schools; Recognize and reward outstanding achievement in science; and Motivate students to undertake and complete scientific inquiries in their special areas of interest. Each year thousands of Ventura County student’s, in grades 6-12, complete science research projects at their schools, and nearly 1,000 of those students earn the right to compete at the Ventura County Science Fair. Approximately 75 of our top students are invited to the State Science Fair to compete with their peers from across California where many of our past students have placed in the top three for their category and some have been awarded Project of the Year. Approximately 275 science, engineering, and industry professionals from throughout Ventura County volunteer their time to serve as judges for the Science Fair. 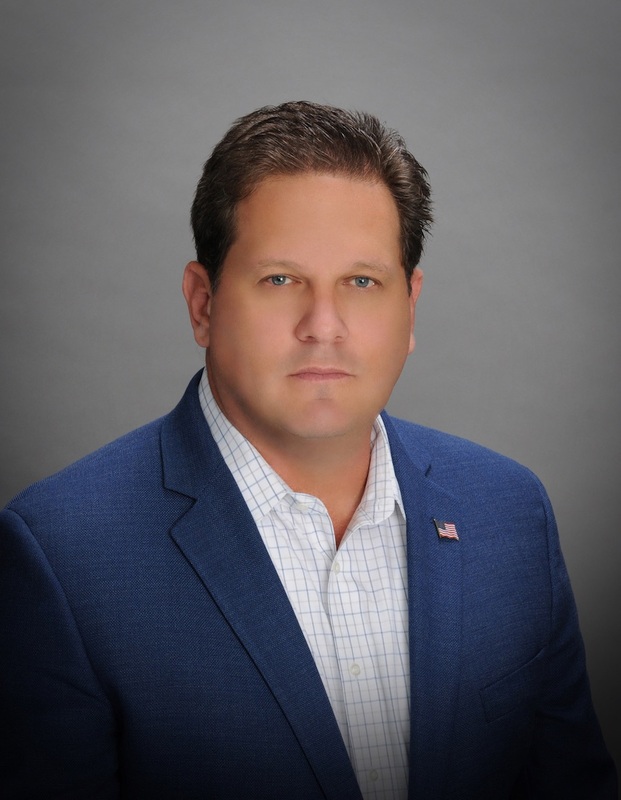 CAMARILLO, CA – December, 2018 –SDC has promoted Shane Geringer to lead it into the next chapter of their storied history of growth, invention and independence in the electronic door security and access control industry. He represents the third generation of his family to assume the role of Chief Executive Officer at SDC. Shane began working in production at SDC in 1988, and learned about the hardware and security business by advancing through a series of positions from sales engineer to VP of Sales, to his current responsibility as CEO and President. Over the last few years, Shane has accomplished a comprehensive re-organization of many SDC departments including Customer & Tech Support, Product Design and Marketing through team-building and strategic investments in people, assets and tools. Not only have these efforts significantly increased revenue year after year, they have included growth in margins as well – all while maintaining SDC’s industry reputation for innovation, quality and its customer-centric culture. Shane has also focused on corporate strategies to improve market-driven product design, new product roll-outs, and solutions development for specific customer segments and market niches. He insures these solutions address the latest trends and needs in the security industry, so the design team can incorporate them into future designs. He also coordinates programs for original equipment manufacturers, value-added resellers, and marketing/sales programs tailored to fit the individual requirements of each SDC business partner. Through his financial acumen, SDC regularly puts available capital to work through outside investments to help fund its growth. Shane is a DHI member, has served on its Editorial Board (2009), and is an alumni of its Technical School (1992 – 1995). Dave Geringer now assumes the role of Chairman and continues to lead the R&D team as well as supervising manufacturing operations with a focus on process improvement, technology adoption and workforce training. SECURITY DOOR CONTROLS (SDC) develops, manufactures and markets mechanical door locks and exit devices, access controls, electronic locking devices for security systems worldwide – the lock behind the system. 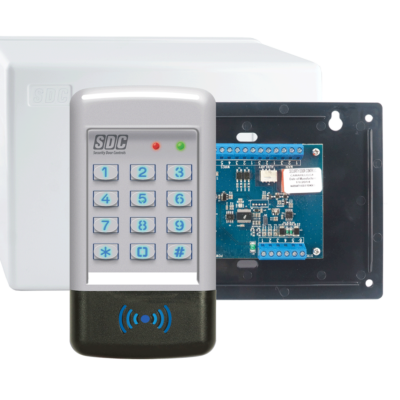 With the convergence of mechanical hardware and electronic access control, SDC provides a bridge from the edge of the network to edge devices for PoE-enabled and IP-based security. We use electrified mechanical door locks and exit devices, access controls and electronic locking devices to provide digital, mobile and electronic access control solutions. As a U.S. manufacturer of premium grade access control hardware specified by security consultants for prominent facilities worldwide, SDC is a recipient of 24 SIA Awards and Recognition for innovative products. SDC has been providing intelligent solutions for Security, Safety & Accessibility to the Industry for over 40 years. A leader in the innovation of products within the electronic security and architectural openings industries, SDC holds scores of patents and trademarks. SDC’s locking systems can be found in virtually any application where access control of a door is required; for example, Duke Power Nuclear plants, North Carolina; J. Paul Getty Museum, Los Angeles; Museum of Modern Art, New York; Exxon, USA; Bank of America facilities, USA; Chase Manhattan Bank, USA; and many airports including JFK International; O’Hare, Chicago; Dallas/Fort Worth; Edwards Air Force Base, California; Chek Lap KOK Airport, Hong Kong; Kuala Lumpur International Airport, Malaysia; and Saudi Arabia’s two largest airports located in Riyadh and Jeddah. SDC brand products are channeled through security products wholesale distributors, systems integrators, contract and wholesale door hardware distributors providing product and technology solutions for Retail, Airports/Transportation, Health Care, Pharmaceutical, Commercial/Industrial Modifications and Retrofit. SDC maintains a ShipQUICKTMInventory of over 150 finished products that can ship to distributors within 24 hours from either east coast or west coast SDC facilities. SDC provides an on-time delivery average of over 98% – as much as 99% for all product orders – a Five Full Year Warranty, and excellent technical, training and sales support. 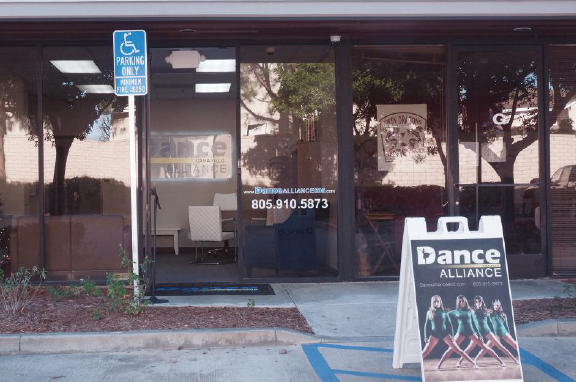 Design and assembly of SDC products takes place in their 24,000 square foot factory in Camarillo, CA, USA and is available worldwide. We’ve held the line on price increases for the past two years*. Beginning January 14, 2019, pricing for over 95% of our Access & Egress Control Hardware, Solutions and Systems will reflect a 3% increase*. 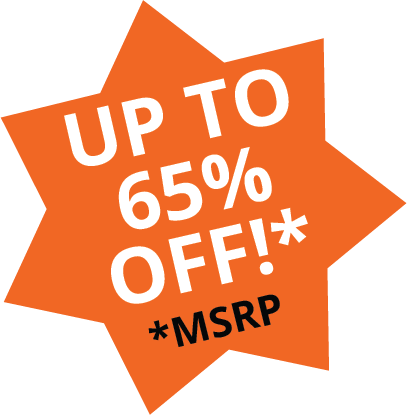 We encourage you to place your orders now to lock in pricing before the price increase. We will not honor pricing from Price List 18.4 or earlier on any project orders placed after January 14, 2019. * U.S. Inflation Rate, $100 in 2016 to 2018: According to the Bureau of Labor Statistics consumer price index, prices in 2018 are 5.18% higher than prices in 2016. * A few selected products will increase more than 3% where necessary to reflect higher material costs. 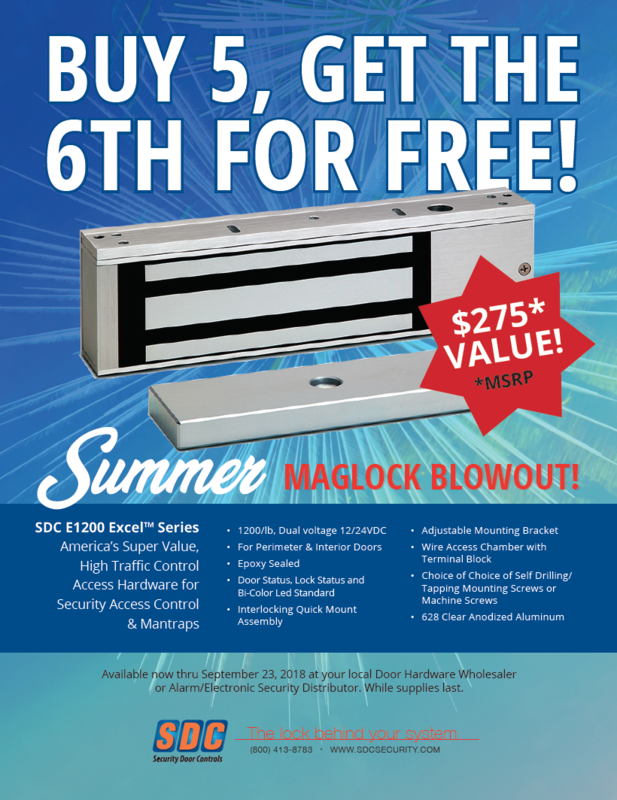 CAMARILLO, CA – October, 2018 – After anextensive national search, SDC (Security Door Controls) selected door hardware and security industry sales veteran Neal Drell as their Western Regional Sales Manager, responsible for allmajor accounts, distributors and security and hardware representatives. Neal brings over 20+ years of door, frame, hardware and architectural sales experience on behalf of manufacturers, distributors and rep firms. 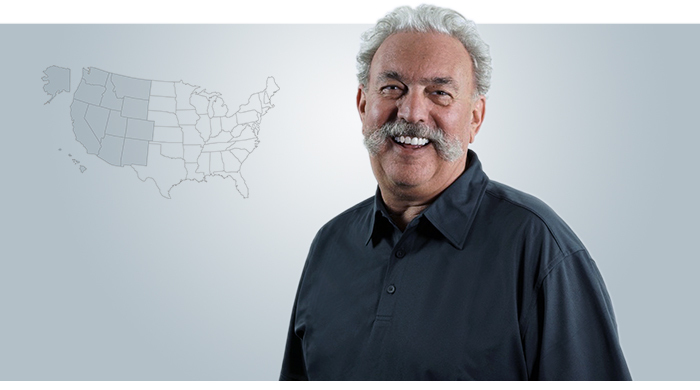 In addition, he brings a wealth of construction specification experience, having been a past president of the San Diego chapter of the Construction Specifications Institute (CSI). 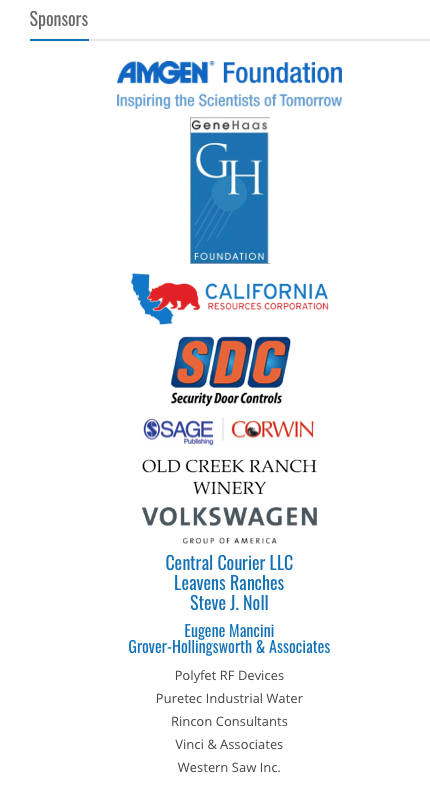 Because the security industry is finding increasing responsibility for the door, Neal will spearhead the integration of SDC’s product solutions, name and brand on the West coast. Neal enjoys playing golf with his wife and pursuing a life-long interest in classic cars. 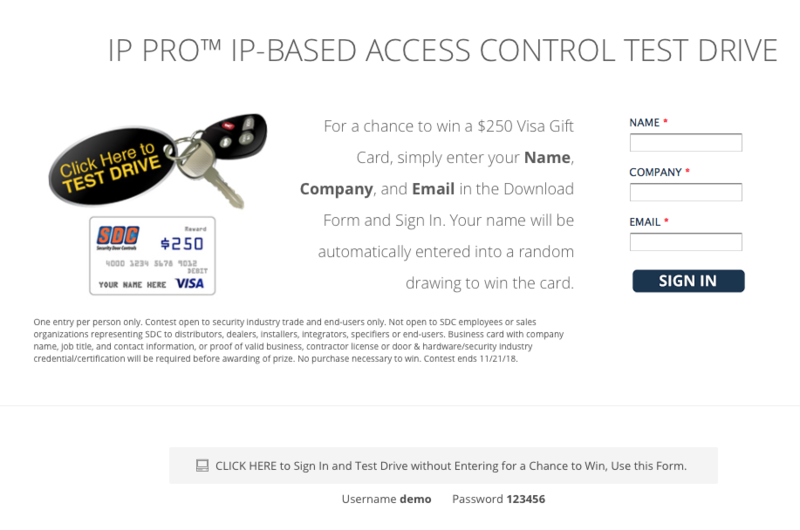 Test Drive the IP PRO & You Could Win $! Click here to visit the IP Pro™ webpage and sign in. 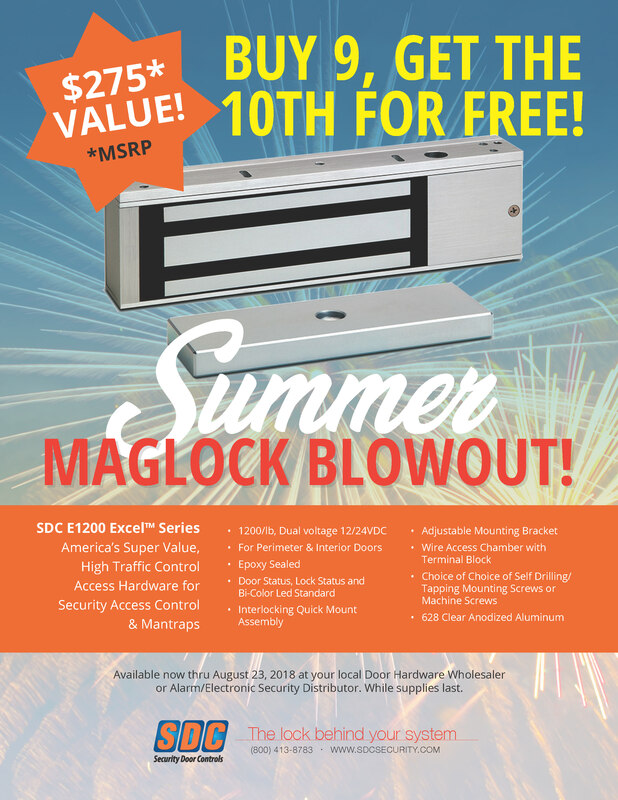 Summer Maglock Special! 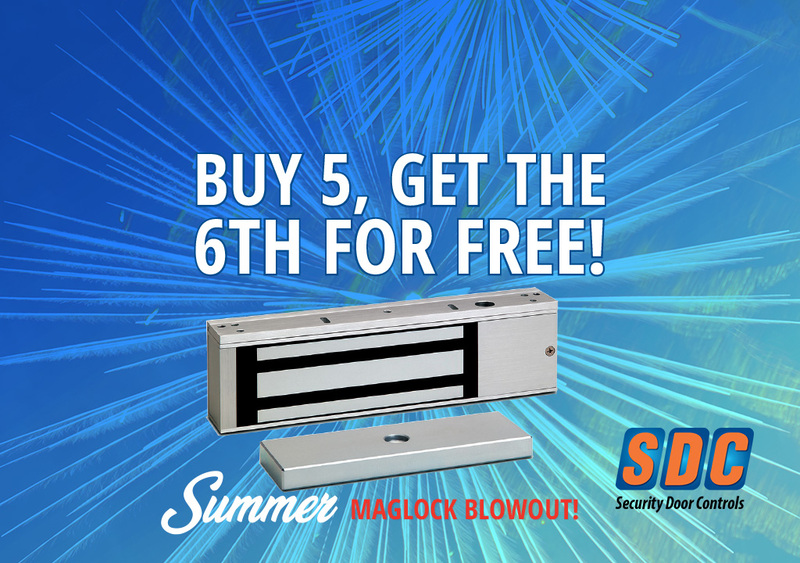 Buy 5, get the 6th FREE!